The new open-source corporate model. No employees, no profits. Just doing nice things for total strangers 24 hours a day. You can't buy this stuff but you can build it yourself. p.s. Got some woods where I can live in a tent? 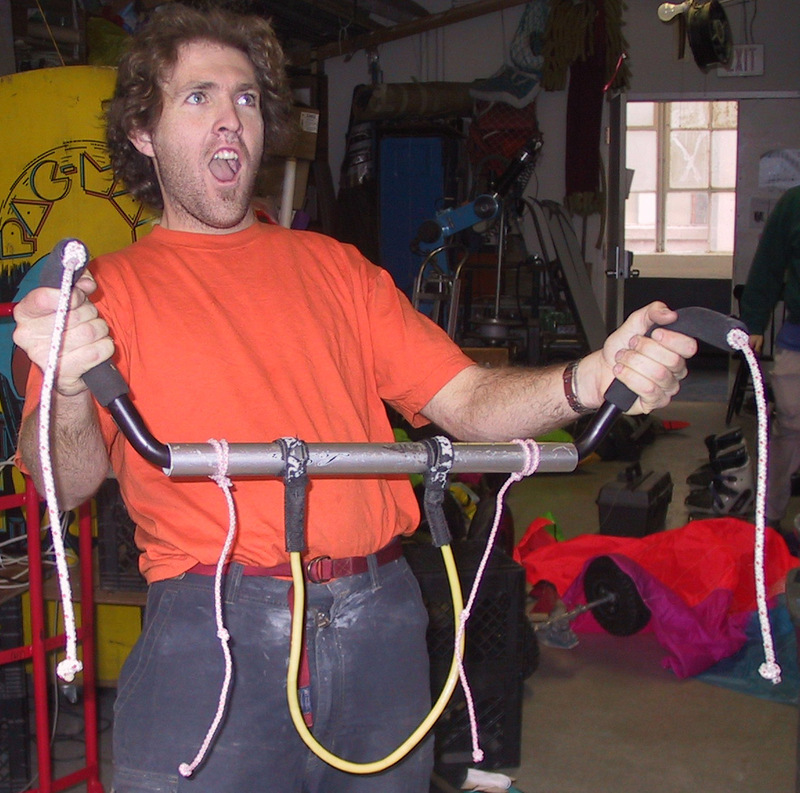 Make your own kite bar and reverse the waste stream at the same time! Here's my collection of broken commercial harness loops. Each failure caused a wipeout and maybe a hand injury or runaway kite. 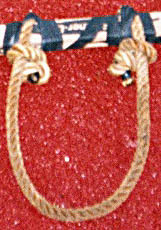 The design was developed for windsurfing and isn't strong enough for kiting. 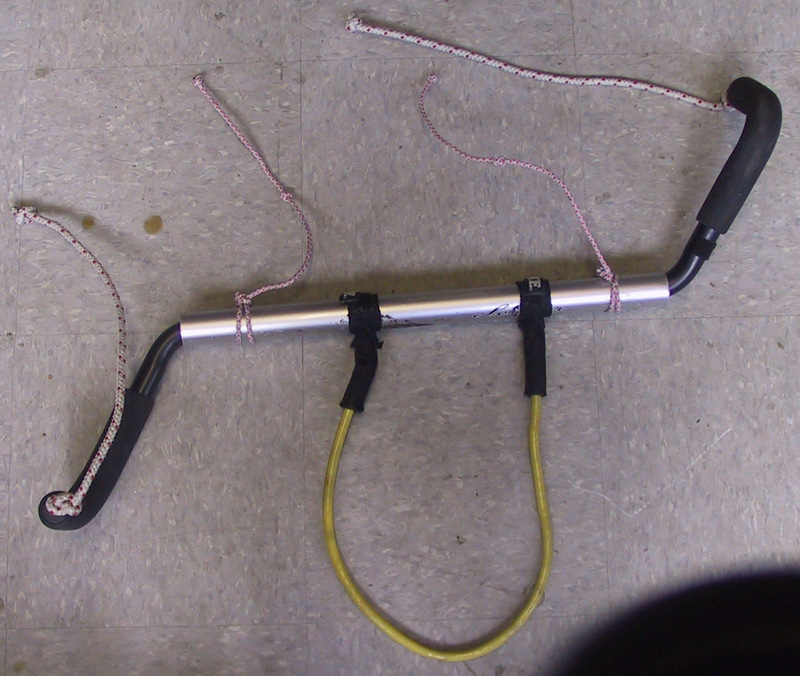 They're lousy as harness loops, but after you break a couple you can tie knots in the broken ends and make pretty slick looking line attachment leaders, as seen below. 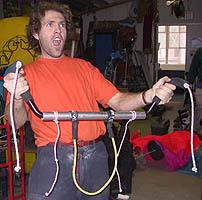 Mountain bike handlebars are strong, light, and easy to grip. They're made to support a violently bouncing human body without breaking. In fact they're exactly like a kitebar should be. This one has corks in the ends so it will sink more slowly. 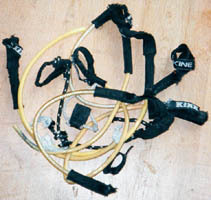 The line attachment things are made from broken harness loops. I like the kitebar ends to stick out like this so I can grip outside the lines. That gives me more leverage and my hands don't get pinched when I turn it all the way. When that silly commercial harness loop breaks my hands won't get hurt. And my bike is a lot easier to walk past without those big handlebars on it. Safety line I mean convenience-leash has quickrelease snap buckle borrowed from a shopping-cart kiddie seatbelt. Straight White Ash carved en homage du axehandle. My pals were always taking it and putting it on their kites. It's thick in the middle so it's never going to break, it's got the beauty of wood, it's light and feels oh so good on the hands.Now it's hidden in a safe place and I use those other bars that don't look like heirlooms. The one shown is setup for four-line foils. Hockey is a great sport. It fills the dumpster behind the rink with these marvels. Hockey sticks are made to be gripped and abused by large primates. They're as light and strong as they can be made. They're usually made from select white ash, which has the highest strength-to-weight ratio of any wood. Many now have carbon fiber reinforcement their whole length. 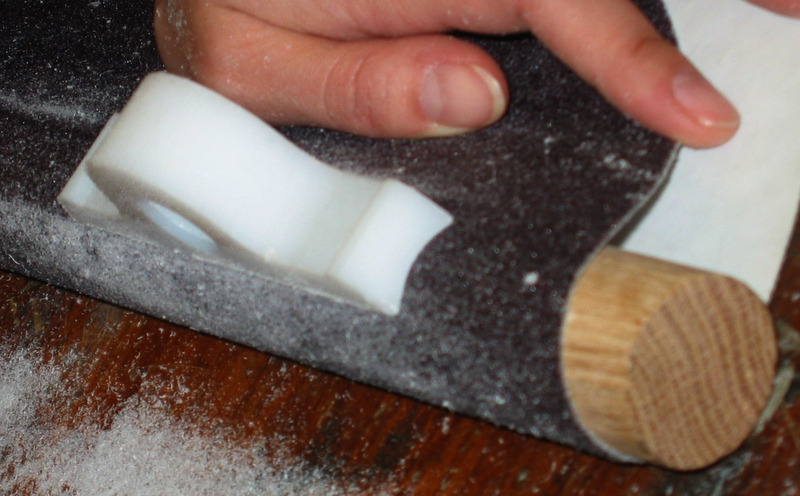 I drilled and cut notches in the ends to wind the lines on, as shown below. I haven't broken one yet. Eventually it'll wear out, but it won't break without warning. I was breaking a commercial loop in a day. 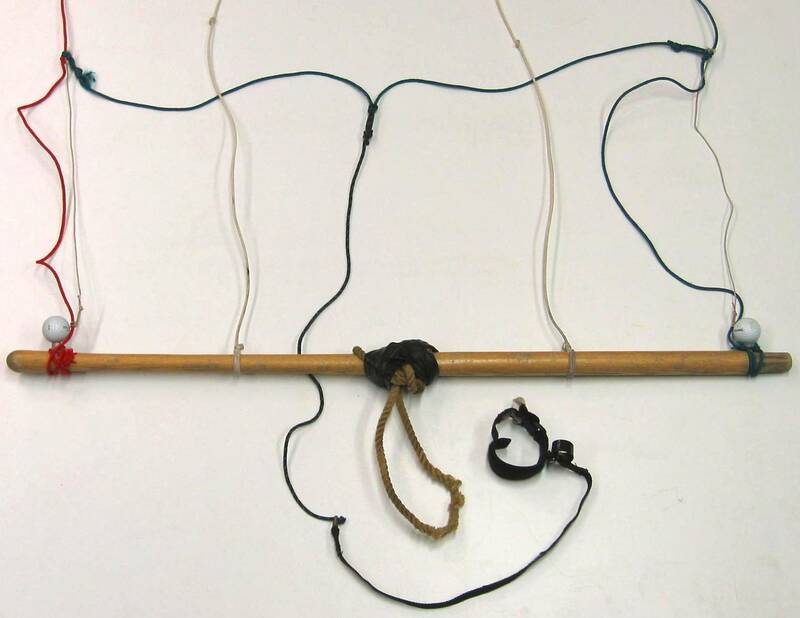 Get any beefy rope and tie it to the bar with slipknots. Use a strip of innertube to hold it in place as shown here if you want it to be extra fancy. This particular nylon goldline is really hard and stiff. I think the factory made a mistake. I unlaid and loosened the ends to make that part flexible enough to tie these knots. The closer together on the bar you tie the ends the longer the loop will last because it won't saw back and forth so much on your harness hook with every turn. In a southwest wind the wind comes at us through a valley and it's pretty smooth. When the front passes we get a northeast wind off the ocean that's very nice. But usually we have an evil north or northwest wind that looks like fists hitting the water. There is one place near here though, where that NW wind is clean and smooth like Wonderbread... The SECRET SPOT. I can't tell you where it is, but I can torment you. The first hint. Who built the largest pyramids in the world? I sawed up a big photo sink and got a lifetime supply of tough half inch thick plastic slabs. Maybe lexan, maybe polypro. Have to get Selena to flame-assay it for me. Anyway, this loop is for ever. It's hooked to the bar with a chunk of seatbelt. I whacked myself in the mouth with it during a wipeout and wished it was a half-ounce lighter. 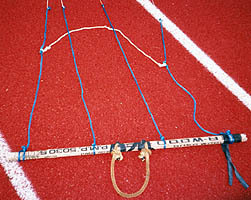 The grey loop is pvc or abs tubing around a piece of polyester rope. I put two loops on to see which one I liked better and never got around to taking the other one off.. Both loops are fine. Can't decide? Neither can this gadget. If you've got a four line kite that needs lots of brakeline action to turn this might be just the thing for you. The middle tube is part of an aluminum bicycle frame. The handle parts are bent aluminum with grips from some kind of workout equipment. The brakeline leaders go right through the middle tube from one end to the other, holding the whole thing together. I tried it and didn't like it. I prefer a straight bar with thick brake leaders I can grab when I need a sharp turn, but like the gentleman on the right, you might delight in this gizmo. American Hickory is even tougher than white ash. That's why tool handles are made out of it. Yet another tough sticklike thing that's made to be gripped. See a pattern? This arrangement looks like a mess, but it's magic with my 10.6 meter four line Kitesurfer XXXL. I change the brakeline tension to match wind strength by wrapping the leaders around the ends. 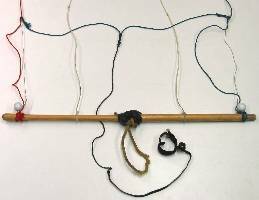 Each leader has a thin bungee cord tied to it so if the kite starts to luff, the bungee maintains just a little brakeline tension and the kite falls up and back instead of curling down and tying itself in a knot. The bungees are clove-hitched to the leaders at so I can slide them to just the right setting. 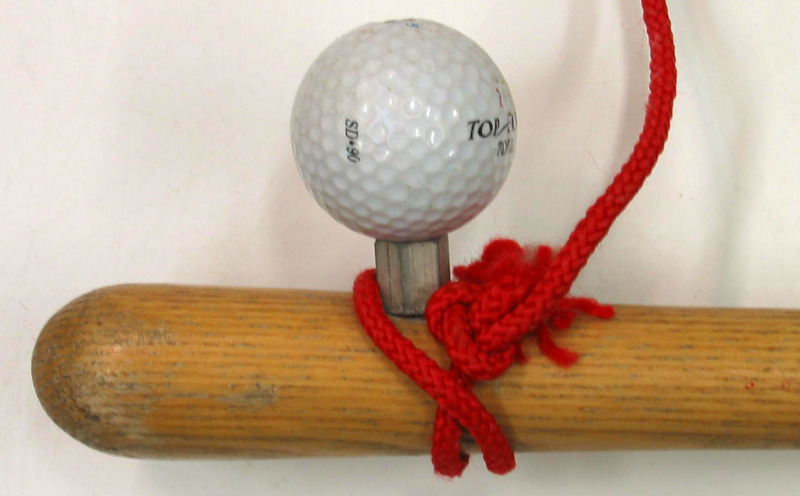 The line winders are made from golfballs and aluminum standoffs from an old decwriter. I was overpowered on my 12meter Flysurfer at 3rd ave and broke the center line. That put all the force on the brakelines and broke the bar. That lost me a chicken loop, chicken strap, ballbearing pulley, and the opportunity to do anything but swim back dragging a giant soggy kite. Enter the brother's garage. A bit of whittling and here's what I had. The line winders are drawer pulls from a hardware store. They're just the right shape and height to trap and twist a finger. It never happened but I worried about it constantly. A salesman in a windsurf store once asked me "What kind of wind do you usually sail in?" And I thought "Same wind as everybody else, whatever wind there is". But I didn't say that. I didn't know what to say. I went out every night regardless of conditions. I sailed in the dark because I got out of work at 5pm and it got dark at 4. I had to get clobbered by scenery and worn out so I could sleep and be sane at work at 8am. So if there was a storm, there I was, out alone on the harbor in a gale in november at night, with runaway yachts surfing past me on their way from a broken mooring to wreck on the rocks. Windsurf stores make me really nervous and uncomfortable, like no matter how much money I spend I'll never be cool. The hole needs to be big enough that the chicken line can slide easily and not so small the chicken loop can pull through it. 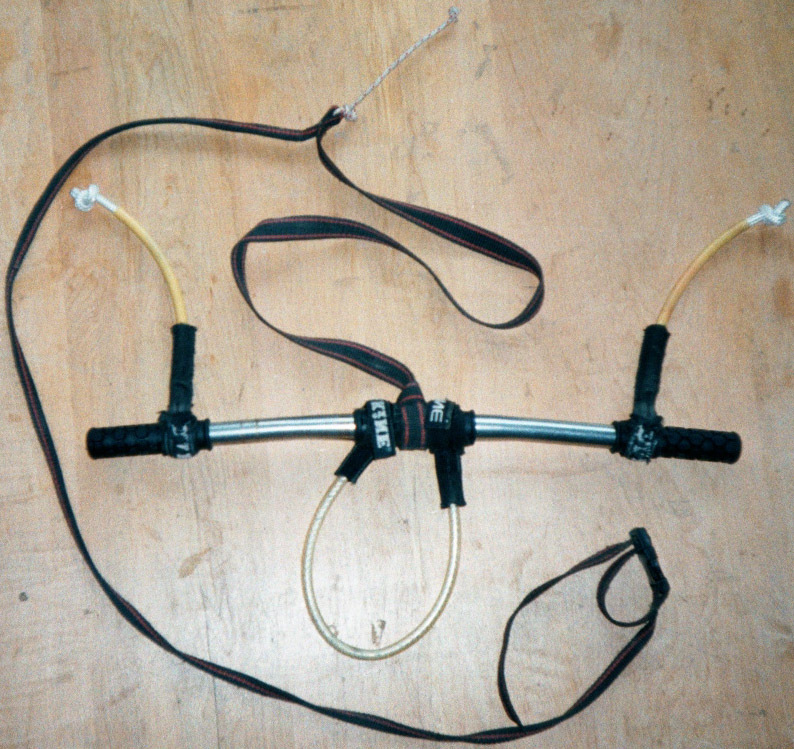 Lash it to the bar with innertube strip and it'll last many sessions until you break the bar. Then make another. Most of those commercial bars run the chicken line through a little hole in the middle of the bar. That thing saws my chicken line in half in about an hour. I started tying on a backup chicken line that goes outside their fairlead. That way I can still sail back to shore after the first chicken line breaks. Kites are designed in places like Maui and Hood River where the wind is great. My work with delusional adults requires me to live here. This wind will drop your kite, roll it in a ball and throw it at you if you don't work that bar like a waterpump. And then a gust will come loft and drag you, beat you with a folding chair, throw you into the stands and beat its chest and scream and jump up and down. In January of '03 we taught a bunch of MIT folks to make kites. This is the prototype bar for the class. The stick is 1.25" oak rod from Mcmaster-Carr. 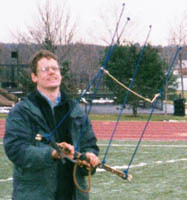 The safety leash uses two rings to pull on one line to arrest the kite when you drop the bar. This whole rig is pretty good. - "Job Creation". Kiting does cost money. Kiters need jobs. Most new jobs in this country are in the service sector, things like painting over grafitti and fixing broken windows. You know what to do. - "Preserving Access". The popular kiting spots are getting more and more crowded. Beginners are always getting dragged down the beach. What if a kid was in the way? Or a piping plover? One accident could get the whole place shut down like that spot in Florida where people kept getting lofted through a freeway into powerlines. So if you see someone acting irresponsibly or unskillfully, it's not nice, but you have to beat them up! Swear at them and throw rocks at their car! Update spring 2003: If you think they might do something wrong in the future, it's okay to just shoot them, blow them up, or lock them in a cage. I learned this on TV from the president. Works well for wrist and ankle leashes. 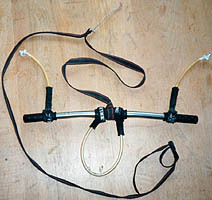 This is what those quick-release snaps on the board tethers snap onto. Made from wetsuit neoprene, seatbelt strap, 1" strap, and plenty of velcro. You'll break needles unless you sew the pieces together in the right order. Figure it out with scraps of paper first. If you get it right your mom's machine will have no trouble. This strap won't yank off no matter what, something else always breaks first. A fluky blast of spray did peel one off my ankle once though. 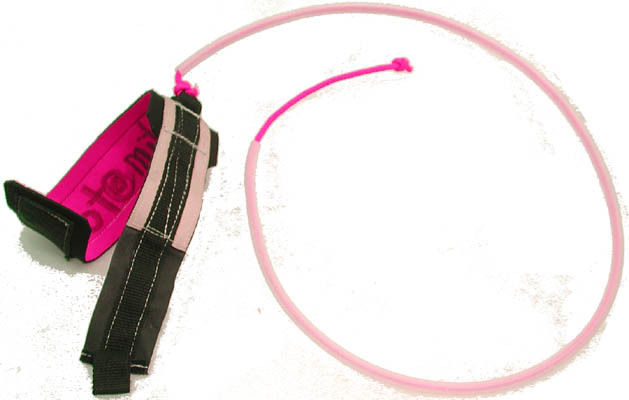 This one is a wrist strap for a four line inflatable kite. I put a polyethylene tube over the cord to make it stiff. 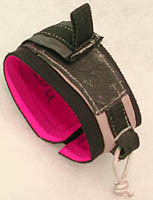 If your wrist leash is too long and limp it flops all around and gets tangled around things like your neck. Look at the accident database to get a fear of such things. Actually this tube is kind of irritating, but that tether needs to be stiffer than it was. This bar was supposed to let me launch in those occaisional windy spots that lack a wide flat empty beach. It made it too easy to tangle the line. Now close your eyes and try to re-invent this bar. You'll probably get it wrong and make one that's really great. Send me a picture so I can do it too. I want one. Instant Winder How do I store this line so it doesn't get tangled? A stick and two nails. CAD file available on request. The stick is a piece of a crutch. To prevent splitting the nail holes need to be predrilled because it's hardwood. You can never have enough winders or find them when you need them. 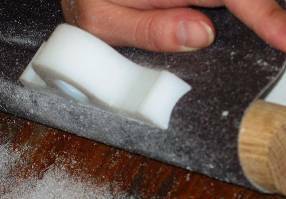 As always, this line is put on in a figure-8 pattern to prevent twisting. various pictures probably copyright Saul Griffith and Eric Wilhelm - check out their works at squid-labs.com and zeroprestige.org.